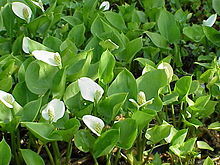 A marsh plant native to cooler areas throughout the northern hemisphere, Calla palustris, having pale green flowers in a white spathe. Informal second-person singular (tú) affirmative imperative form of callar. Formal second-person singular (usted) present indicative form of callar. Third-person singular (él, ella, also used with usted?) present indicative form of callar.